Articolo : ANSCMCM066 Disponibilità : PochiPz. 1927 entered into history as the year of birth for the Mille Miglia, the famous 1,600 km racing course through Italy. By 1930, the name of Mercedes-Benz was closely bound up with this endurance race. And the first victory came in 1931 for Mercedes-Benz. In 1955 Mercedes-Benz introduced its 300 SLR for the first time at the Mille Miglia. Among its strongest competitors were Ferrari, Maserati, and Aston Martin. Every minute a competing car got its starting clearance. Since 1949 the starting order had been decided by lot so that each starting number was a record of the starting time. The young-but-well-accomplished British race driver Stirling Moss, together with his co-pilot Denis Jenkinson (“Jenks”), received the starting number 722. It means that their exact starting time was 7:22 am. What an unforgettable race they presented that day! Denis Jenkinson invented the so-called Roller-Map, a sort of “navigation system“ that would become a part of racing history. This Roller-Map was a six-meter paper roll with details of the track information collected during the training sessions. As a result, he was able to give his pilot very exact tips. Thanks to his driving skills, his will to win, and the reliability of his 300 SLR, Stirling Moss already took the lead in Rome. After 10 hours, 17 minutes and 48 seconds, the duo of Moss and Jenkinson crossed the finishing line to become the victors. They reached an unbelievable average speed of 157.65 km/h. An unparalleled record for a long time to come. J.M. Fangio, also driving a 300 SLR, finished 2nd to complete a sweet dual triumph of the Mercedes-Benz. After a victory like this, all the ordeals that the drivers and the race car had to go through - the painful jolts from driving over countless kerbs and the hard landings after jumping with full throttle over cambers and rough roads – were forgotten. At the end of the race, the only braking left was from metal on metal, because the friction pad was completely used up. Our SLR is hand-mounted from more than 1,500 single parts. It is a precision model that incarrozzeriarates well-documented historic details and authentic replication. 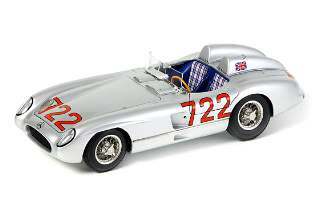 Explore the realistic presentation of this great model, and you will feel somehow like Stirling Moss. By the way, Moss drove the whole race with the service panel removed to expedite maintenance work in the case of emergency. He simply could not bear to lose a single second unnecessarily. But if you do not feel capable of filling the shoes of this legendary race driver, then picture yourself as his co-pilot. You don’t even have to do without Denis Jenkinson’s roller-map, for we have a miniature version of that equipment added.